Graph from the Department of Commerce report showing how many Americans have competition for broadband services at high speeds. Spoiler: not nearly enough. You know broadband competition in most parts of the country is terrible. We know broadband competition in most parts of the country is terrible. The FCC knows broadband competition in most parts of the country is terrible. Heck, even Comcast kinda sorta knows that broadband competition is mostly terrible. And so the findings of a recent major government report, which finds that broadband competition is really terrible, should not be a surprise. The Commerce Department has recently released a new report (PDF) that tells us in detail exactly what most of us already know from our lived experiences: for huge swaths of the country, broadband competition is a joke at best. We see it play out everywhere: for most of us, broadband is cable, and cable is (by design) a local monopoly. Although alternate technologies exist, most of us don’t have fiber, and DSL just isn’t up to par. FCC chairman Tom Wheeler said as much back in September, and the new round of data bear him out. For DSL-level speeds of 10 Mbps, a solid 70% of us can choose between Company A and Company B, but only 28% of Americans have a choice of three or more providers. And the picture gets more dire as the wires get faster. Move up to 25 Mbps — which Wheeler has argued is likely the “table stakes” for broadband service going forward — and the situation sours fast. The silver lining is that 86% of Americans do have someone providing 25 Mbps service in their area. The bad news? For most of us, it’s exactly one someone. Only 37% of us have a choice between even two providers (often one cable company and either FiOS or U-Verse), and only 9% can choose among three. Keep upping the speeds, and the numbers get worse. 59% of Americans have any access to speeds of 100 Mbps, and the vast majority of those have only one provider to turn to. Only 8% of Americans can choose between two or more ISPs for speeds of 100 Mbps or better. The Commerce Department report also illustrates just how slow the much-vaunted expansion of gigabit fiber in the U.S. really is: only 3% of us have any access to it at all, and everywhere such service is provided, it’s a monopoly. The report also breaks down what technologies are available: 89% of the country could sign up for DSL service, but only 21% of us actually do. 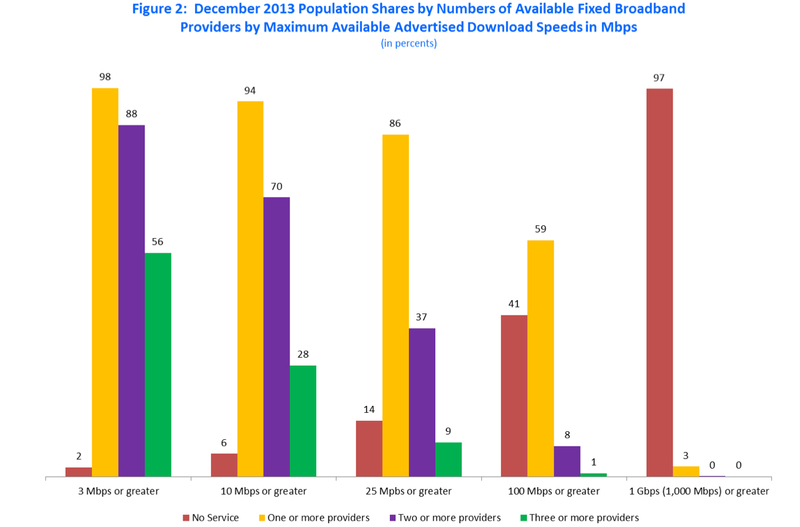 24% of households nominally have access to fiber, but only 8% are signed up. Most of us — 43% of the country — get our internet service from cable TV companies. The report authors also account for wireless broadband tech. Though the technology is weaker, the competition is much stronger: 99% of Americans are considered to have access to 10 Mbps mobile broadband (though in reality, those speeds vary widely), and 71% of us have at least three providers to choose from. The study also notes, however, that with unreliability, speeds usually below 25 Mbps, low data caps, and price-prohibitive overage fees, mobile is not yet viable as a full replacement for wired broadband.